It was a race against the clock to get back to Toronto at a time when spring in the clock was about to set forward [ sorry – deadlines are deadlines sometimes ] but it was the finale to what was another exceptional Saturday night in Alliston with the Renegade Derby Dames. This had been the third time back into this arena by yours truly – the first time being a Hallowe’en style fun scrimmage followed by an actual doubleheader featuring juniors against juniors from Toronto Junior Roller Derby then the Durham folk going up against the Renegades. What was utmost for this night was the drive to keep the Alliston Memorial Arena alive. Petitions were set up to be signed. The show that was put on by the league and organizers clearly showed everyone the Derby spirit was alive and could be family friendly to boot. Visiting Alliston has always been fun – with friendly drivers, players or zebras willing to make the relatively short trip out from Toronto. Going on the ups and downs of the highway conjured flashbacks from days of going up to nearby Molson Park in Barrie for all the Edgefests and Lollapaloozas or Picnics. The floor of the track proved smooth and the arena lighting was more than bright enough in comparison to the lamented Hangar. Photographers always try to bring their own touch and the league with its own resident photographer was more than willing to accommodate the wishes. The team travelling in for the bout of the night were the Derby Debutantes from the GTA Rollergirls. These were not your mother’s Debutantes all clad in the pink for the ball. In fact, save but a handful, these were not even last year’s Debutantes. However, it was good to see a friendly face or two with Coach Hissy Curlington and Pinky Tuffadero behind the bench. Dixie Wrecked remained a Debutantes wearing the C while a Chrome Mollys or two such as Wretched Gretchen now wore pink for the night. Corey Maim wearing her L2D had come over from the D-VAS along with another skater or two. Otherwise, this was literally a brand new freshie Debutantes with no familiar 76 or 1000 wearing a Psycho helmet. Some of these Debs had literally just passed their minimums. This would be the first bout of the year on the calendar for both leagues. It may only be the beginning of March but Derby was already heating up in the south. Queen City launched their new year back in the first week of January, Toronto Roller Derby got rolling in February, Derby starts earlier and earlier these days with WFTDA type leagues trying to boost their rankings for tournament points or rankings while other leagues fledgling or otherwise after a hiatus of in house training or mentoring were anxious for a little ol’fashioned knockdown and hitting someone aside their mates. However, this is March and in Alliston there is one thing to remember: there is no heat if any to be found within the playing area of the arena itself. The cold necessitated the wearing of layers or winter bundles by the spectators, so for the players in their Derbyskinz, who knows? Heat is on the list for the arena improvements. The Misfit Militia showed during the warm-up superior speed on skates which would be the rule for the night. Faces seen down at Toronto Roller Derby already two bouts deep into their season [with Quad City Chaos just ahead at the end of March] such as Renny Rumble #1205 with the Smoke City Betties and BelleFast #5678 with the Death Track Dolls were also part of the Misfit Milita Squad coached by Slewfoot Sinclair. The Militia were not letting up by any means. But the best way to keep the crowd enthused was the players themselves who provide the dance moves and fast paced action infused with staredowns on the line, penalties along the lines of elbows, low blocks, high hits and referee takeouts, who cares if it was a 361-17 blowout anyway? The Militia jammer rotation took care of the score taking to the inside or the outside or through the middle while the Misfit pack were doing their utmost to contain the Debs jammers. Hits could be seen coming from a mile away. 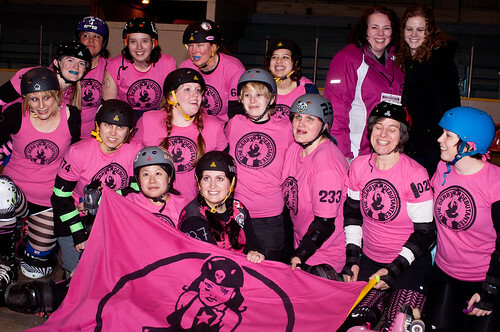 MVPs for the night were for the Debs #28 Olivia Nuke’Em Bomb and for the Misfit Militia #55 Party Crasher. It was a night of fun, showing everyone once again that there is a fanbase of Derby, that the event could be run successfully with family fun and affordable local beer. Local flavour was provided at half time from budding star Tori Hathaway who was dressed to the nines and singing and playing guitar to Taylor Swift, Tori has some stage presence and professionalism to her banter as she played to the crowd&emdash;she’s the real deal. 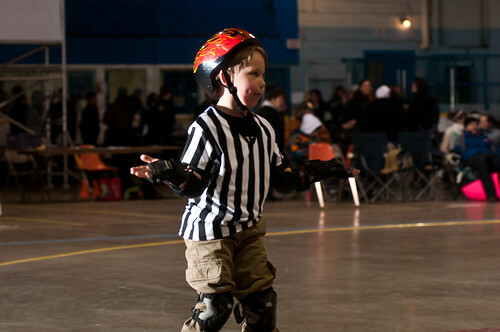 A small exhibition of junior roller derby as a small handful of skaters showed off their skills and another referee in the making. The whole night built the case for saving Alliston Memorial Arena. The afterbout was one after-party after another after-party with much Guinness and can you say Coyote Ugly? Lots of Cranky reminiscences and stories of film and music to and on the way back kept the drive alive. And did we mention the discussion of Battle Axe Throwing?